Hi folks! Ruthie with Arizona Oriental & Specialty Rug Care here and I wanted to share some advice today for my readers and clients who have recently gotten a new puppy or are planning to. There’s no denying that bringing a new puppy home as a new member of the family is a big treat! However, new puppies also come with new responsibilities – namely house training. There’s bound to be accidents along the way as the puppy learns, and this can be an issue if you have fine area rugs in your home. My advice to you today is this: Remove your area rugs from areas where your puppy will be until they are fully house trained! This will help to prevent area rug disasters and will also save you a massive headache when it comes to trying to get all of those deposits out of your rugs. Animal urine is very acidic and, if left untreated, will cause permanent damage to your area rug’s delicate wool or silk fibers. Staining from animal urine may not come out with cleaning. Urine accidents will also eventually cause dry rot of the fibers if not treated. Dry rot weakens rug fibers and can cause rips, cuts, tears, and holes to form in the rug in areas with urine deposits. Bringing a new puppy into the home and lifting up your area rugs is a great time for Arizona Oriental to clean your area rugs. 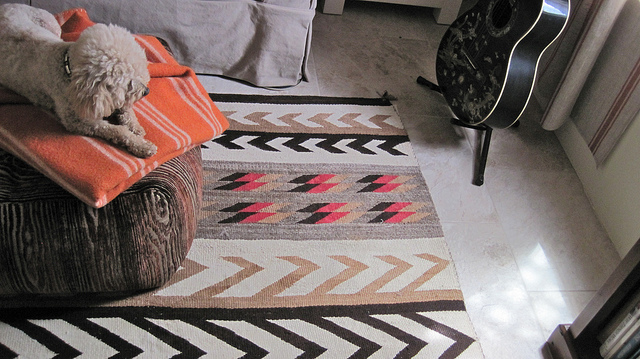 We also offer pick-up and delivery services if you are unable to bring your rugs to us yourself. At our rug washing facility, we will clean your rug thoroughly and bring the colors back to life again. Your area rug will get all nice and ready to be put back down on your floors whenever your puppy is done having accidents. We can also wrap your rugs in a breathable wrap to protect your rug while you store it. Only store clean rugs – NEVER STORE A DIRTY RUG! Moths already love finding rugs that are stored away without protection in dark, quiet areas where they won’t be disturbed. But if your area rug has food or drink spills or even puppy accidents, that’s like creating a whole big buffet for them! These spills create additional proteins on your rug’s fibers, which moths just LOVE. It’s always a joy to bring in a new family member, but make sure you aren’t too distracted with them to forget to care for your beloved area rugs, too!